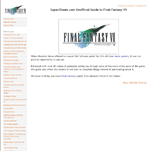 The definitive ad ultimate guide to Final Fantasy VII by Absolue Steve. Ehanced only on SuperCheats with over 60 videos showing you his gamelay and .. Check out our huge collection of cheats that includes getting all the characters ultimate weapon, stamina recovery during races and easy victories in boss battles. 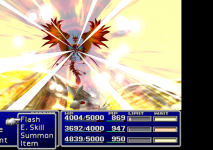 Plenty of hints and tips for you to look through and try, these include getting the Quadra magic without a Chocobo, limit breaks and getting the Masamune blade. 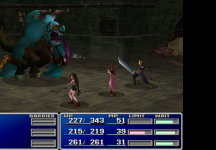 We have 542 questions and 1389 answers for Final Fantasy VII. Check them out to find answers or ask your own to get the exact game help you need. I need help using used gs code for limits and can't usebthebitem for the four. Is it possible to resurrect aeris using a gameshark code? 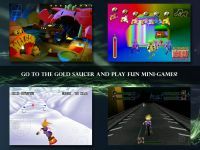 I know where the Mega all is but when I get there it ..
A large collection of videos including ones for stopping Midgar's Cannon!, the underwater reactor and the Final Fights of this Fantasy. 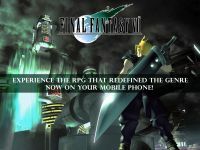 The Final Fights of this Fantasy,..
We have 37 Walkthroughs for Final Fantasy VII. Lots of walkthroughs and FAQs to help you with the game. We have guides for emerald and ruby weapons, limit break mechanics and bosses. 120Whos your favorite team character in FF7? This is a review submitted for the 1997/98 RPG classic ps1 game Final Fantasy VII. Please note bef.. Final Fantasy 7 is one of the greatest Final Fantasies ever made. It takes place on Earth, but the..
Unluckily, my full review was accidentally deleted because of the crappy comp I used to attempt to.. This game is a long good game. It features a character named Cloud trying to beat a character name.. This game was awsome as well. The relativity and interactiveness was perfect. I give this game a 8.. This game is still at the top of my favourite games list after three years. Well done Squaresof.. Rocket Code-Combination for Buhamet ..